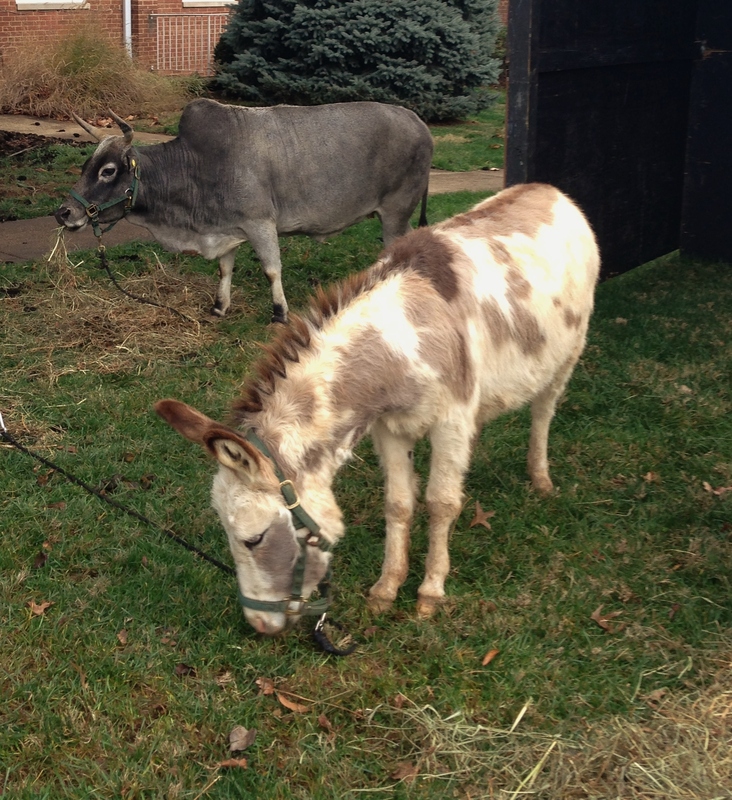 As has become our custom, our family spends the latter part of Christmas Eve afternoon at our church’s live nativity. The day was chilly and gray, the ground muddy, as usual. 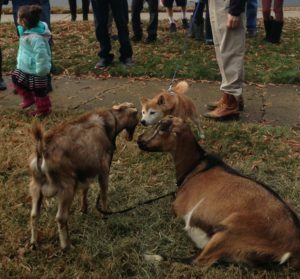 The friendly beasts were in attendance–the stocky little burro, the hump-backed ox with the coat of gray velvet, the fluffy, disheveled sheep, a variety of curious goats. 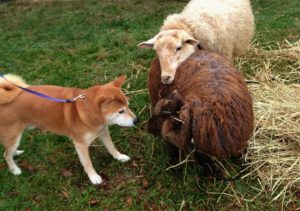 Kiko was obstinately determined to sniff out every furry friend. 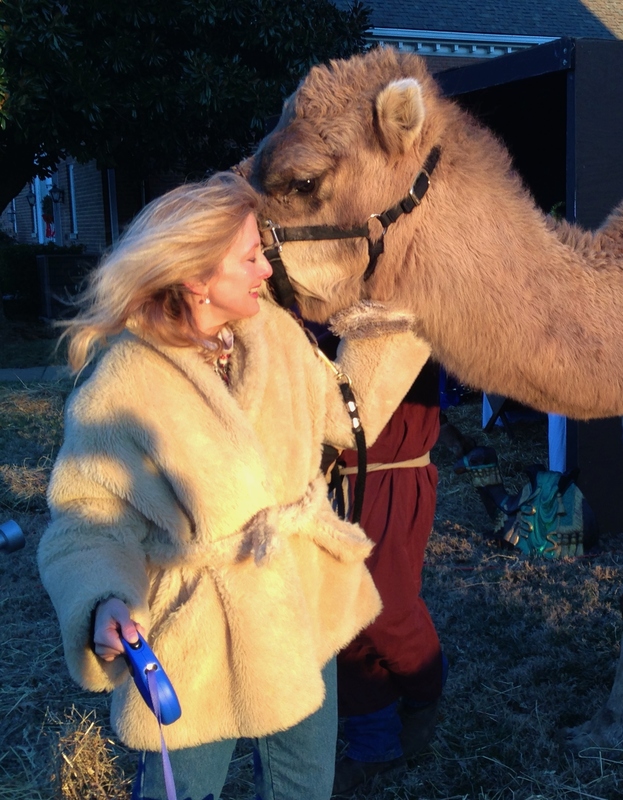 The sweet-tempered camel was there, of course. A gracious celebrity, as well as a commanding and unexpected presence in the DC suburbs, he posed patiently for photos. 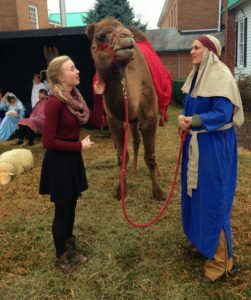 He even gave out a few kisses. Humans took turns in the roles of the Holy Family, angels, shepherds and kings. 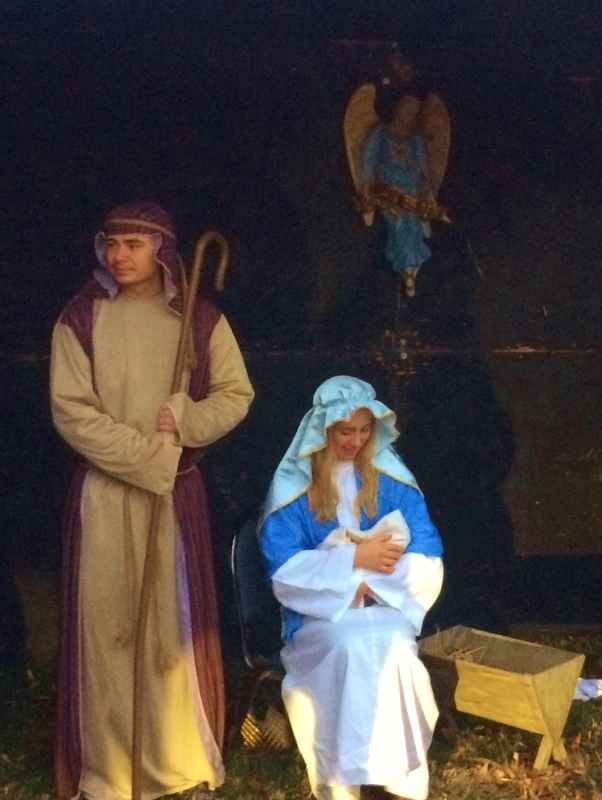 Baby Jesus, to the disappointment of several young families, was played by a doll. 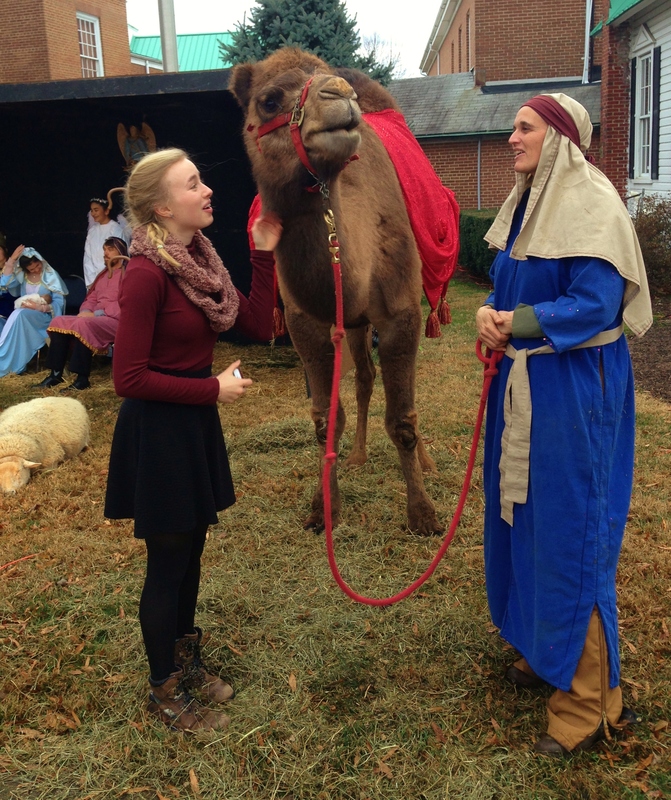 Sometimes Mary and Joseph were fourteen, sometimes forty. Occasionally the costumes fit well, other times, not so much. Hems tended toward the mud-stained. Gender was fluid. 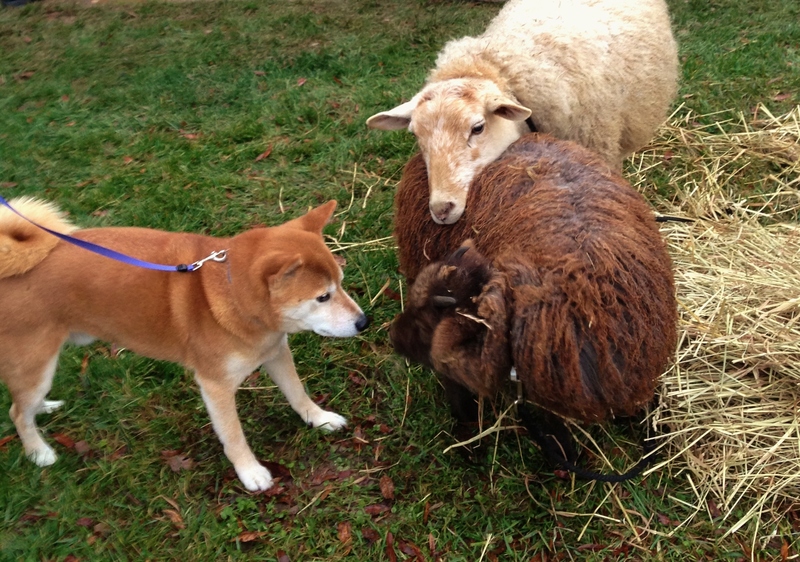 One of our shepherds, in his attempts to drum up even more attention from passers-by, appeared to be hitchhiking. It wasn’t a flawless performance piece, by far. But it didn’t need to be. Who else but ordinary, imperfect people does God use to do his extraordinary work? 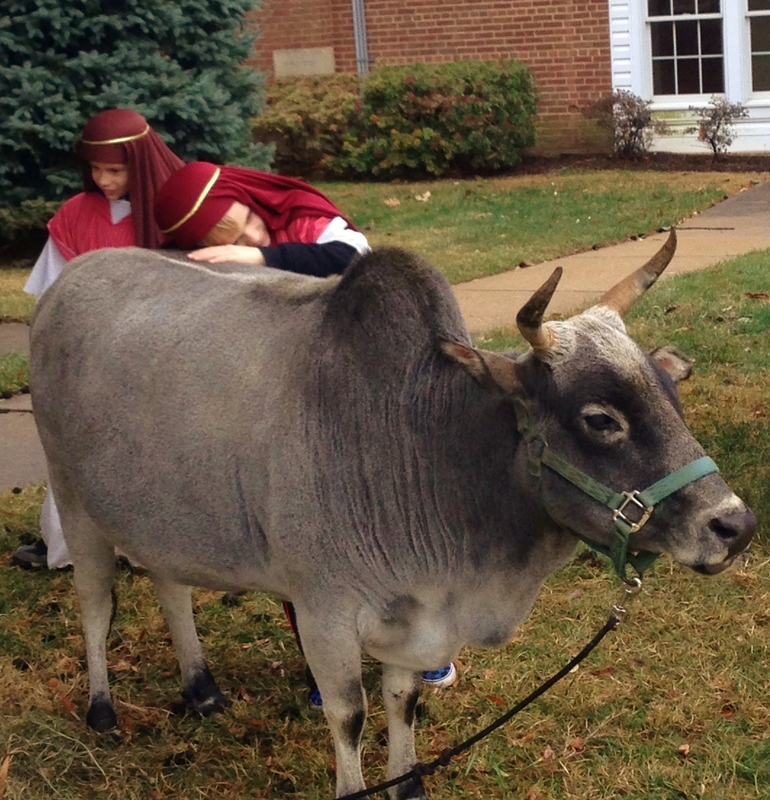 The rushing Northern Virginia traffic was forced to slow down, if briefly, as it passed our live nativity. Many people even put their Christmas Eve plans on hold, parked their cars and explored the scene first hand. Most left with a camel selfie. Some, we hope, caught a glimmer of a greater truth. He is born, the holy Child, play the oboe and bagpipes merrily! He is born, the holy Child, sing we all of the Savior mild. Through long ages of the past, prophets have foretold His coming, through long ages of the past, now the time has come at last! O how lovely, O how pure, is this perfect child of heaven, O how lovely, O how pure, gracious gift to human-kind! Jesus, Lord of all the world, coming as child among us, Jesus, Lord of all the world, grant to us thy heavenly peace. Il est né, le divin Enfant, jouez haut-bois rèsonnez musettes! Il est né, le divin Enfant, chantons tous son avènement! For previous Christmas Eve live nativity posts, see here, here, and here. Previous PostFavorite Christmas PostsNext PostOnce Again, Merry Christmas!